At the Personality Plant, robots are being built and slowly outfitted with the artificial memories of real people. Suzu is one such robot, being made to replace the young boy a family has lost. By chance, he meets Hotori, a young girl suffering from progressive memory loss. The two children become friends and attempt to define themselves in the light of their changing memories. The film won the Animax Awards (an anime script-writing competition) in 2004. Over the decades anime has produced some of the most compelling works of visual fiction on the planet. Since the turn of the millenium though, it seems as though the medium has gradually matured in terms of content and focus. One of the reasons for this "coming of age" is critical and media attention, especially over the internet, however there is an even bigger impetus in this maturation process - recognition as a creator - and it's this driving force that fuels the award known as the Animax Taisho. Hotori: Tada Saiwai wo Koinegau (or, Hotori: I Only Want Happiness), is the script that won the third Animax Taisho award, and was adapted into an anime in 2005. The original script was written by Miyazaki Maya (I don't know if there's any relation to the esteemed Miyazaki Hayao though), and the anime adaptation is, if anything, a singular example of the storyteller's art at work. The anime tells the tale of two children, a girl called Hotori, and a boy called Suzu, and the ensuing friendship and care they have for each other even though they are complete oppsites in the most basic and fundamental of ways. The plot is very simple and straightforward, yet possesses a complexity that is truly wondrous. The pacing never gets flat or stale, and the OVA approaches the bittersweet, yet hopeful, climax with a steady, unwavering tread. The story itself is both moving and sensitive, especially in it's depiction of the two children. Nothing is overblown or overly dramatic, and the whole show has a pervading sense of calm that belies the heartache of the characters. The most important aspect of the show is the question of what defines one's existence, purpose and place in the world - basically, what is a "soul"? It's this one simple, yet extremely complex, question that is the cause of all the joy, pain, happiness and suffering for the characters, and it's to the credit of Miyazaki Maya that the tale takes a more sensitive and innovative approach than shows like Ghost in the Shell or Blade Runner. The idea of putting the question in the hands of two children, one of whom, is losing their "soul" while the other is gaining one, raises the OVA from being simply another bland concept anime, and while there will be those who view the use of children to be a play on the viewers sensitivities, the simple fact is that Hotori: TSwK works better because the main characters are children, and thus are more open to questioning the right and wrong of things. Adults would simply add complications to an already complex question. Visually the show looks very good. The characters are well designed for the most part, however their facial expressions are a little on the limited side. The backgrounds and settings are well realised. and there is a clear definition between the more naturalistic designs used for scenes in the greenhouse and outside the hospital, and the more clinical, detailed designs used inside the hospital and the Personality Plant. Animation is also pretty good, with the characters moving well for the most part, although there are on or two niggly little moments when something about the scene seems "off". One thing that is truly remarkable about Hotori: TSwK is the cast. All but one of the seiyuu have played leading roles in a number of well known shows, and it's a truly remarkable coup for a script written by a complete unknown to have such talented and experienced voice actors on board, regardless of any competition wins. As one would expect with such a great cast, the acting is very good throughout the OVA, and each of the seiyuu portrays their respective characters with a grace and sensitivity that is very much in keeping with the theme of the show. In terms of music the show is very well served for the most part, however there is one section where the track simply didn't fit the emotion of the scene. The OVA also makes good use of sound effects and silence, in particular during the opening few minutes of the OVA. As this is a single episode OVA, one would expect there to be little in the way of actual development in terms of the characters, however this is not the case with Hotori: TSwK. The fact that one person is gradually losing who they are while another is becoming someone else entirely makes for some strangely captivating development that, while semmingly sporadic, is very much in tune with the basic question of what defines a soul. The fact that the two main characters are children also acts as a buffer for characterisation, as one does not expect a child to be a fully formed individual, and because of this the characters, especially the two leads, work extremely well in their setting. Granted there's virtually no development to any of the other characters, however this is very much a secondary consideration when watching the show. Given that the script was written by an unknown in the anime world, it's surprising, but also pleasing, that Hotori: TSwK is as good as it is. The question of what constitutes a soul is handled very well, and while there is a similarity to other shows in certain ways, this represents a very different approach to the norm. While there is some definite science fiction elements to the series, they are downplayed in favour of a more human approach, and it's this that ultimately defines whether one enjoys the show or not. In essence, if you want your metaphysical questions put forward in a scientific or religious manner, then this may not be to your liking (it still doesn't hurt to give it a try though). Hotori: Tada Saiwai wo Koinegau is a remarkably simple story that encompasses a truly complex question, one that is epitomised by opposites and dichotomies, and it's to the credit of all parties involved in it's production that the show is able to impart it's message in such a clear and sensitive manner. The biggest kudos though, should go to the judges of the Animax Taisho for recognising that the original script was something a little bit special. I'm very much looking forward to watching the other winning OVAs now, especially if they're as good as this is. “What exactly makes us people?” is a question that fiction, especially in the last ten years or so, seems to enjoy tackling, and with varying degrees of success. We seem to have an obsession with trying to define the undefined, and figure out exactly what element (if any) dwells within us, differentiates us from each other, and makes us more than just flesh and blood. Hotori: Tada Saiwai wo Koinegau (Eng. “Hotori: The Simple Wish for Joy”) is another one to add to the long list of anime about maintaining an identity in a technologically advanced world, but solid character concepts and good writing in general are enough to make it a standout OVA that floats near the top of the mark. The story, set thirty years in the future, centers on a place called the “Personality Plant.” At the Plant, doctors create robots that are externally identical to humans, and slowly implant them with the memories of real humans who have died or are in the process of dying, thus allowing at least their personalities to live on even if their original bodies are gone. Suzu, a robotic child from the Plant, is being conditioned to turn into a replica of “Ryou,” the dead son of a pair of grieving parents. One day he meets Hotori, a girl suffering from a disease that eats away at her memories. The two share secrets with each other and become close friends. As time passes, Hotori's illness worsens, and the obvious question rears its ugly head: Should she have her memories preserved in a robot? It's not a complicated story, but it has a certain deviousness in the way it is structured to reflect the aforementioned theme of human identity. The OVA quietly asks whether it'd be better to fade away gently, or fight the inevitable and be forever remembered in a robotic replica. As humans, most of the cast members, Hotori included, seem inclined to think that memories placed in an artificial shell do not a human make; the devious part is that following this line of thought will lead to the conclusion that kind and helpful Suzu is not a “real” person, but an empty construct, a statement that no one, least of all Hotori, seems overly enthusiastic to make. The story and its narrative themes are cleverly interwoven, and the distinct lack of philosophical jargon or lengthy exposition is a definite plus. The OVA finds two noteworthy characters in Suzu/Ryou and Hotori. What makes them interesting is that they're fundamentally different in their illnesses—Hotori's memories are rapidly disappearing, while Suzu is rapidly gaining new ones—yet the effect on both of them is similar. They both feel like they're losing themselves, and question who they really are. So, despite the fact that they're opposites on one level, they're also capable of understanding each others' doubts and fears in a very personal way. This well-thought-out relationship is the driving force behind the OVA. At forty minutes, it wouldn't be fair to compare the character development found here to that of a feature-length film or a series, but given the rather limited time frame, a commendable job has been done. The pair might not be fully realized individuals in the way that we typically think of memorable characters, but they're strong concepts that are used to great effect. I'm generally wary of the use of children as main characters, as they're sometimes included for the sole reason of preying on the audience's baser instincts and generating cheap sympathy, but here, I don't think that's the case. The OVA works, in part, because it adroitly points out that children can sometimes have a much better sense of what's right—what should and shouldn't be done—than adults. When the pair finally decide on the path they want to take, they proceed with ominous finality. These are kids who believe in nothing but each other, and there exists a certain terrible gravity in watching them put their heads together to make decisions that would turn most rationally thinking adults into sobbing wrecks. We don't sympathize with them just because they're kids, we sympathize with them because they're kids who are forced to bear responsibilities that no child should ever have to bear, and make adult decisions when their only tool is the simplistic logic of children. The OVA's weakest link is the music. There's nothing wrong with the soundtrack itself—quite the opposite. Much of its strength lies in orchestral pieces that start off subdued, but slowly build to an explosion of strings when the moment is right. However, odd musical choices occur on a couple of occasions. These normally manifest themselves in the form of upbeat jazzy/contemporary songs playing at times when they really shouldn't be, leading to some strange mishaps in which the scene seems to be saying one thing while the music is saying quite another. Taken as a whole, the music is better than average, and these flaws, while noticeable, aren't worth getting in too much of a twist over. Artistically, it's a pretty good looking product for its day and age. For the most part, the characters are designed well, but they have extremely small mouths (even by anime standards) and there are several moments where they're speaking, but the lip-flap animation is near invisible, making it almost look like conversations occur in a voice-over. The visual centerpiece of the OVA is the secret greenhouse where Suzu and Hotori play—as it should be, given its symbolic role. It's an attractive design, with the radiant greens and blues, highlighted by sunlight, being an obvious contrast to the dark institutional halls of the Personality Plant. There's a noticeable lack of depth in the backgrounds, giving them a flatness that's not very appealing, but the distinct use of light to bring out their coloration balances it out. Overall, this is an impressive OVA. There are some minor missteps in the technical areas, but inside lies a cleverly written story that approaches its themes with applause-worthy care. And at forty minutes, I'd say that's an accomplishment. Hotori is a movie that picks you up. slaps you in the face, tells you not to cry and then just leaves you there to snivel like a baby, all in the span of about half an hour. I have to say that I feel bad fo the producers, unless they were going for a minimalistic film this just feels to me like a nice big plot confined to a low budget and bad art. I feel like they wanted to do something but they didn't have the time or money, and thus for me the feeling of a true story I could care about was lost. It felt very rushed and when the sad moments lasted only seconds I would start to cry only to be carted off to another scene so they could fit them all in the short amount of time they had. I couldn't really care about the characters because I couldn't connect, they seemed very flat and only meant to fit into their specific parts for the movie, not free thinking characters who would later surprise me, and they didn't. The unexpected became mundane when the art became very moe and big eyed at all the wrong times. It invalidated itself, which is sad because it had some potential. This was a surprisingly powerful TV special despite its rather short length. 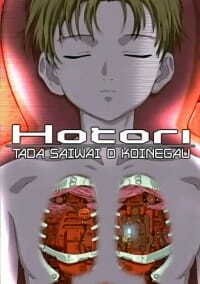 Hotori explores the interactions between a human girl with a terminal illness (Hotori) and an android in the form of a boy (Suzu) who interact with one another as they share the problems they both share with memories, the former whose illness is destroying her memory and the latter whose memories are being formatted to resemble the dead child of a couple looking to adopt him. The special retains a melancholic mood throughout its run in depicting the interactions between the two as they contemplate their individual situations and try coming to some understanding on how to approach them as understanding the human experience is new to android Suzu as he interacts with Hotori, whom puts on a strong front to cover up her own fears of losing the memories of her family to her illness. The exploration of how machines try to comprehend the human condition in sci-fi/ cyberpunk titles is nothing new in anime. But Hotori: The Simple Hope for Joy's exploration of this focus is quite grounded, simple and more relatable to follow. The ending to the anime, which I won't spoil here, goes for a bittersweet approach which while predictable, is still heartwarming when things conclude with the special. The animation for Hotori is solid featuring a great amount of detail in the designs of scenery and characters with subdued color tones that enhance the dramatic mood given off by the series. While animation isn't the prominent focus for the special, movements within scenes seemed natural and I didn't notice any shortcuts or errors within the 40 minute run of Hotori. Music for the anime consisted mostly of piano and light musical pieces that did their part to enhance dramatic moments within the series, though there was nothing that greatly stuck out for me with the title's soundtrack. Considering the lack of action, complex animated sequences and large focus on human drama found within Hotori, this won't be a title for fans of more popular and mainstream anime titles or anything more optimistic with its mood. But if you are looking for something out of the ordinary for an anime and have interest in titles delving into elements of the human condition, Hotori: The Simple Hope for Joy is a definite watch in my personal opinion.